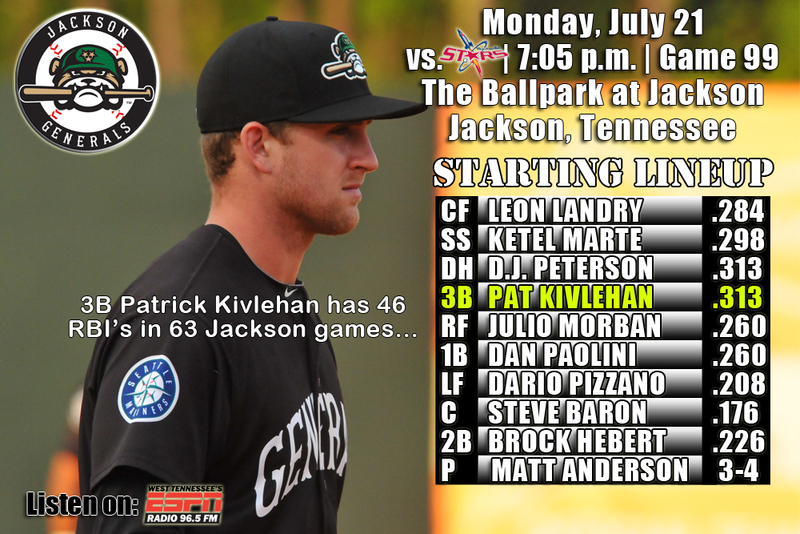 • The Generals begin a five-game series at The Ballpark in Jackson tonight against the Huntsville Stars…Jackson is 7-8 against Huntsivlle this season and 3-2 in Jackson…,will play the Stars 10 more times during the final 41 games of the regular season. • The Generals received the first home runs of the year from Leon Landry (2×5, 2 R, 2B, HR RBI) and Ketel Marte (2×4, 2 R, HR, 2 RBI, BB), but it was not enough as Montgomery walked-off for the second consecutive night with a 9-8 win on Sunday at Riverwalk Stadium. • Jackson went ahead 8-7 with a 2-run homer from Marte in the eighth, but Montgomery plated 2 runs in the ninth against reliever Trevor Miller to walk-off with the win. • Brock Hebert (2×4, 2 R), Pat Kivlehan (2×4, 2 RBI) and Landry had 2-hit nights for Jackson in the loss, while D.J. Peterson (1×4, 2 R, BB) and Julio Morban (1×5, RBI) factored in offensively. • INF Ketel Marte recorded his 30th multi-hit game on Saturday and he currently ranks T-8th in the league in batting (.298), 1st in hits (112), 5th in triples (6), 5th in stolen bases (21). • OF Leon Landry ended a 466 at-bat homerless streak on Sunday with a solo shot in the 5th inning at Montgomery. Landry hit 6 homers in 2013 and the last came in Jackson vs. BIR on 7/3/13. His last homer on the road was on 5/25/13 at Montgomery. • SS Ketel Marte ended a 430 at-bat homerless streak with a 2-run shot in the 8th inning on Sunday at Montgomery. Marte’s last homer was on 8/21/13 vs. Rancho Cucamonga. It was just Marte’s 4th home run of his career. • OF Dario Pizzano is batting .349 (15×43) this month with 10 runs, 3 doubles, 4 triples, 2 home runs, 13 RBI, 11 walks and posted a .482 on-base percentage. His July OPS is 1.226. • July by the numbers – After batting .294 as a team in June, the Generals are currently batting a league-best .281 in July. The 17 July home runs ranks 2nd in the league and 9 wins is T-4th. • Extra Extra Bases – The Generals currently ranks 2nd in the league doubles (179) and 2nd in the league in triples (35). They also rank 2nd in the league with 94 stolen bases. • Racking up At-Bats – SS Ketel Marte currently leads the SL in at-bats with 376, 7 more than Huntsville’s Nick Ramirez. • OF Leon Landry has hit safely in 19 of his last 20 games, batting .308 (28×91) with 14 runs scored, 3 doubles, 1 triple, 1 home run 6 RBI and 7 stolen bases. Since June 7, Landry has hit safely in 31 of his last 34 games with 16 multi-hit efforts, batting .340 (48×141) with 22 runs scored, 6 doubles, 3 triples, 1 home run, 8RBI, 3 walks and 14 stolen bases. During this 30 game stretch he has raised his season average from .236 to .284. • 3B D.J. Peterson has hit safely in 18 of 20 games with Jackson, batting .317 (26×82) with 12 runs scored, 4 doubles, 4 home runs, 8 RBI and 7 walks. Peterson cufrently leads all the Mariners Minors with 23 home runs this season.